The Anaheim Fall Festival was that same day as the parade, so Mister Spooky and I showed up around 4pm to get a parking spot, grab a bite to eat, and check out the festival, held a block away from the parade route. 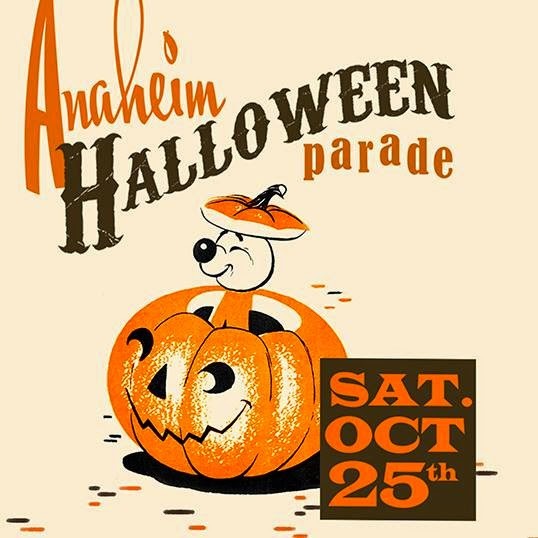 We parked in the residential neighborhood a few streets south of the beginning of the parade route, then walked a mile or so to the Anaheim Promenade where the fall festival was taking place. I grabbed a delicious Reuben sandwich and yam fries from Healthy Junk, we walked around a bit, then headed back towards the beginning of the parade route to grab a good viewing spot and to enjoy our food. There were lots of people who showed up for the parade, and the two-mile parade route was pretty packed. Some people even came dressed up and those who lived in the area had parties to watch the parade from their front lawns or porches (the old houses down there are gorgeous, by the way!). It was a fun, energetic atmosphere! The Headless Horsemen kicked off the parade! These vintage-inspired floats/characters were one of my faves! The Flying Sasser, a historic float that was first in the parade in the '50s! The Rocket Witch! Totally cool retro float! him here!)! They were my faves! I love pumpkinheads! And this one was riding a wooden horse! front is riding a broom! (middle right), and cute costumed kids behind it (top right). These beautiful Halloween trees where mesmerizing! So pretty! This spooky spider float even had shoes on its legs! So creepy cute! and candles, and two towering calaveras! screaming the kids in attendance were petrified by them, mwahahaha! Another Day of the Dead display! You can find more information on the parade on their official site!